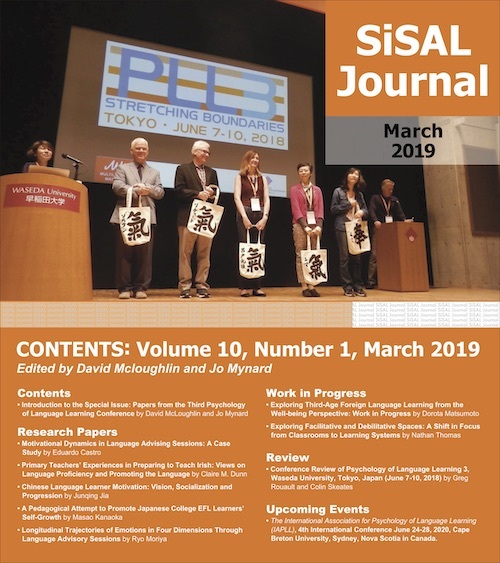 Welcome to issue 6(3) of SiSAL Journal, which is a general issue. It contains two research articles followed by three papers that form the second instalment of the language learning spaces column edited by Katherine Thornton. The first paper by Anas Hajer based at the University of Coventry in the UK reports on the involvement of ‘significant others’ (e.g. parents and friends) as experienced by a group of learners learning English in their Arab homelands. Using a sociocultural lens, the author analyses data from written narratives and follow-up interviews and suggests that ‘significant others’ have a role to play in identity formation and attitudes to learning English. The second paper by Brian Birdsell based at Hirosaki University in Japan looks into the challenge of attracting students to voluntarily enter and participate in self-access learning. Taking the concept of ‘curiosity’ as a starting point, the author examines associations between curiosity (as indicated on a scale) and students’ exploratory behaviour for participating in self-access activities. The theme of the second instalment relates to the roles of learners themselves in supporting self-access language learning. In an introductory article, Katherine Thornton summarises the three contributions in this issue which come from Marie-Thérèse Batardière and Catherine Jeanneau from the University of Limerick, Ireland; Carol Everhard (formerly) of Aristotle University of Thessaloniki, Greece; and Elvira del Carmen Acuña González, Magdalena Avila Pardo and Jane Elisabeth Holmes Lewendon based at the Universidad del Caribe in Mexico. The December 2015 issue will be a special issue on self-access and young learners edited by Annamaria Pinter, Robert J. Werner and Jo Mynard and the call for papers has now closed. Further information can be found at https://sisaljournal.org/for-authors/call-younglearners/. If you are interested in guest-editing a future general or special issue on a theme related to self-access learning, please get in touch. Many thanks to members of the review and editorial boards for their help with producing this issue and to the authors for choosing to publish with us. Jo Mynard is the founding editor of SiSAL Journal. She is an associate professor and the Director of the Self-Access Learning Centre at Kanda University of International Studies in Japan. Dr. Mynard holds an Ed.D. in TEFL from the University of Exeter, UK and an M.Phil. in applied linguistics from Trinity College, Dublin, Ireland. She has taught EFL in Ireland, Spain, England, the UAE and Japan, and has been involved in facilitating self-access learning since 1996. She has co-edited two books on learner autonomy and two on advising in language learning. Her most recent book ‘Reflective dialogue: Advising in language learning’ (co-authored with Satoko Kato) has just been published by Routledge New York.